Lightly grease a 33x23cm/13x9in baking tray that is about 3cm/1in deep. Line with cling film. Put the oats and almonds in a food processor and blend for 10–20 seconds, until fairly well broken down (you want some texture, but it should be slightly powdery). Tip into a large bowl then add the seeds, cranberries and rice pops and stir really well. Heat the agave syrup, peanut butter and honey in a small saucepan over a medium heat until melted. Stir, then pour this over the oat mixture and mix well with a spoon, until cooled slightly. Mix with your hands to make sure all the oats are coated. Tip into the tin and spread out evenly. Lay a sheet of cling film over the top, then press down firmly to squash the mixture flat. Leave in the freezer for 1 hour until set. Remove the top layer of cling film, then tip out onto a board, remove the remaining cling film and cut into 24 bars. To keep, layer them up between sheets of greaseproof paper and store in a sealed box in the fridge. They can also be kept in the freezer. Make them with porridge oats and chopped nuts if you don’t have a food processor. 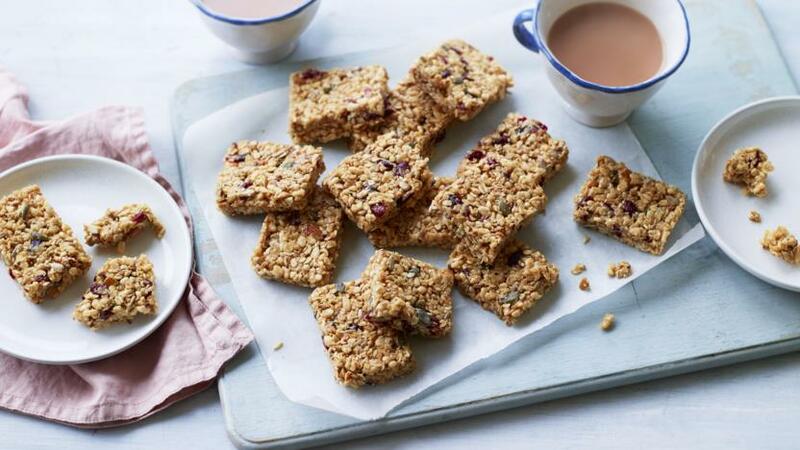 If you need these bars to be gluten-free, ensure you use gluten-free oats.